We start out by making our Mango & Black Bean Salsa which is so good you could eat it by the spoonful! 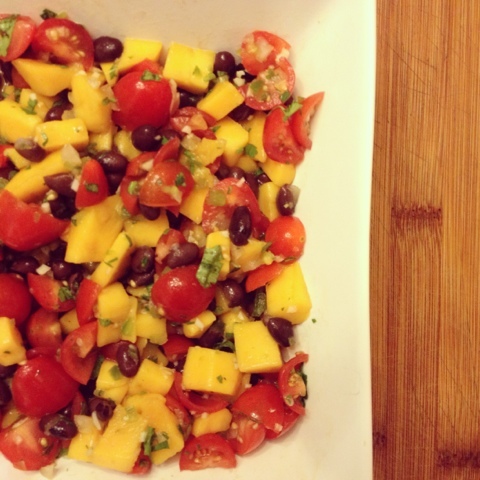 Simply toss together mango, black beans, grape tomatoes, onion, garlic, lots of fresh cilantro and the juice from one lime! Simple and delicious! 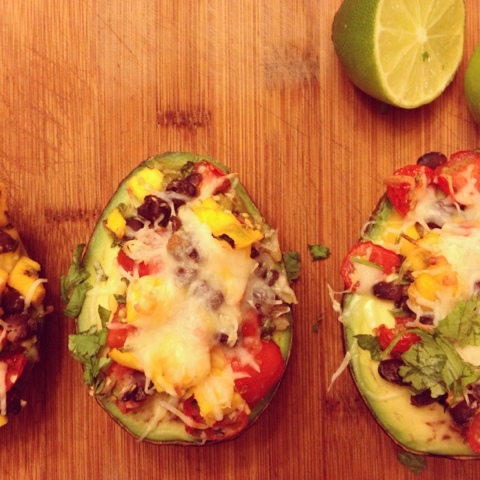 Simply stuff your avocado, top with Mexican cheese and then pop them in the oven to warm the avocado and melt the cheese! Enjoy this little taste of heaven for lunch, or alongside a lean protein source for dinner! How good would these be served up with our Cilantro & Lime Shrimp Skewers, or our Grilled Chicken Kebabs with Jalapeno Cilantro Pesto! P.S. 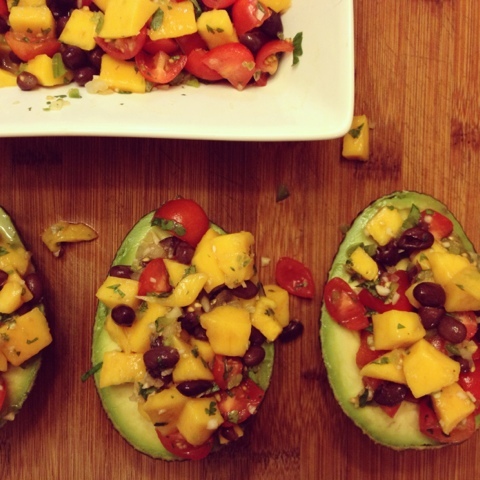 don't be afraid of the fat content as avocados are loaded with healthy fats you're body needs! 2. To make salsa add mango, tomatoes, black beans, jalapeno, garlic, onion, and cilantro to mixing bowl. Mix around and squeeze in the juice from one lime. 3. Slice avocados in half. Remove pit. Load each avocado half up with 1/4 of the salsa. 5. Top each half with 1 tbsp. Mexican cheese and bake for another 1-2 minutes to melt the cheese. 6. Garnish with chopped cilantro!